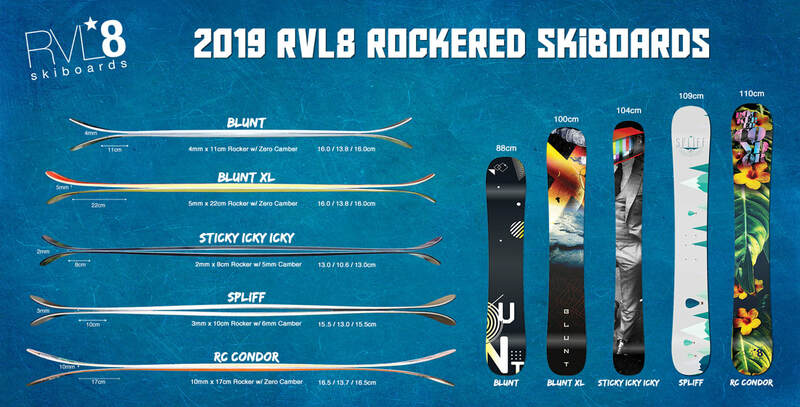 The 2019 RVL8 Spliff represents the culmination of over 4 years of research and testing of rockered skiboards. RVL8 had been producing traditional cambered (raised up under foot) skiboards for 6 years when they made the first ever rockered skiboard in 2012, the Rockered Condor. Rockered skiboards offer the epitome of powder performance. By rockering (angling up) the tips and tails slightly you open up a whole new world of float, but most traditionally rockered and zero cambered skiboards struggled to perform well on ice or groomed (on piste) snow. There just wasn't enough edge making contact to hold a fast line on hard snow. Enter the 2016 rockered and cambered 109cm RVL8 Spliff skiboards. With 3mm over 10cm rocker combined with 6mm of camber the Spliff is the best performing sub 110cm skiboards regardless of conditions. The true one skiboard quiver. The 2019 Spliff graphic is by veteran RVL8 designer Martin Azevedo. Visit our dealer page to find a RVL8 dealer nearest to you.